Some time ago I gave away a package with a dou my hands a disinfectant handspray and lotion. And I hope that the winner is still happy with these products! 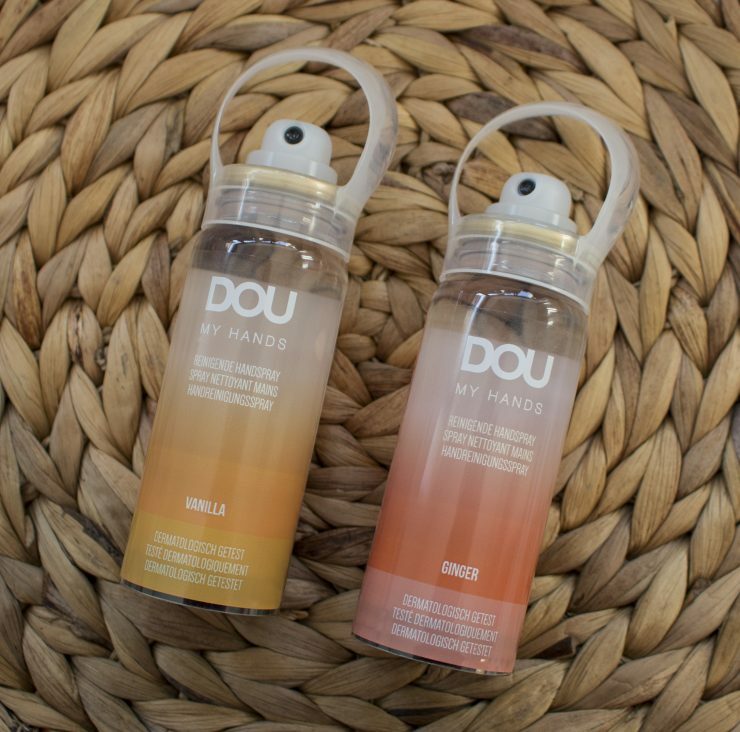 And I also had the chance to try out the dou my hands disinfectant handspray in ginger and vanilla. I often use a disinfectant product but then a gel but each time I take too much product or too less. So these sprays looked like the perfect solution. Because these are handy for on the way and quick! That was what I expected… So how good and handy are these sprays? Dou my hands has these disinfectant handsprays in 4 different scents. You got neutral, ginger, vanilla and since recent you also got guarana. Expect the handsprays they also have lotion in a spray form. Because this is in a spray form it’s easy to apply and to take with you. The packings are also not too big so like I said perfect to take with you. It’s also easy to use these spray’s. You daze the spray onto your hands and rub into your skin. And that’s it, then you have clean hands. The spray also works easy and you can easy dose it. Ginger, if I didn’t know that this was the one with the ginger smell then I thought this would be the neutral one. It’s a very subtle and fresh smell. So both handsprays work exactly the same it’s only the smell that is different. And this vanilla smell is a good warm sweet but also fresh smell. I really love it! This one you also smell afterward but subtle. So except a cleansing and caring working your hands will also smell good afterwards. I’m fan from the smells, but mainly from the vanilla version! It are handy disinfectant handsprays. You can use these multiple times a day without drying out your hands. So you don’t need any soap and water, so a spray works so fast and easy! I also find this better working that such a gel. You just spray it on your hands and rub it into your hands. So if you ask me then are these handsprays amazing! They give you clean hands and they smell so good and the best part… the spray makes your hands soft! So dou my hands convinced me all the way also because of the pretty and handy packing. So from now on bye bye handgel and hello handspray. Dou my hands is available at the pharmacy and the price is €8,99 for 50ml. wat een mooie flesjes, zeg. Alleen al daarvoor zou ik ze overwegen om te halen. Al vind ik ze wat aan de dure kant. Wat grappig is dit zeg. Die vanille lijkt me heerlijk.